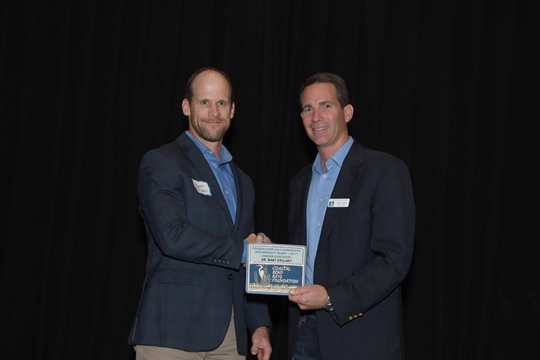 Dr. Bart Ballard, professor and research scientist for the animal, rangeland and wildlife sciences department at Texas A&M University-Kingsville, recently received the Conservation and Environmental Stewardship Award in the higher education category from the Coastal Bend Bays Foundation. Ballard also holds the C. Berdon and Rolanette Lawrence Endowed Chair in Waterfowl Research at the Caesar Kleberg Wildlife Research Institute. The award is given to a university or college institution, individual professor or instructor for their dedication and effectiveness in educating Texans about the natural resources of the Coastal Bend. Ballard teaches and conducts research on the ecology and management of birds with a focus on waterfowl. He has been committed to the research and conservation of wetlands and water birds along the Texas coast for many years. The Coastal Bend Bays Foundation is a public interest organization dedicated to the conservation of freshwater and coastal natural resources for current and future generations through consensus, facilitation, communication, advocacy, research and education. The group’s 12-county area includes Aransas, Bee, Brooks, Duval, Jim Wells, Kenedy, Kleberg, Live Oak, McMullen, Nueces, Refugio and San Patricio counties. The Conservation and Environmental Stewardship Awards Program recognizes and honors outstanding Coastal Bend citizens, educators, businesses, governing bodies and other entities that have made significant contributions to education and protection of Coastal Bend natural resources, habitats and native species.